A grand hotel that epitomizes the glamor of Italy's golden years, when the Tuscan coast attracted members of high society from all over the world and hotels were built like royal palaces. 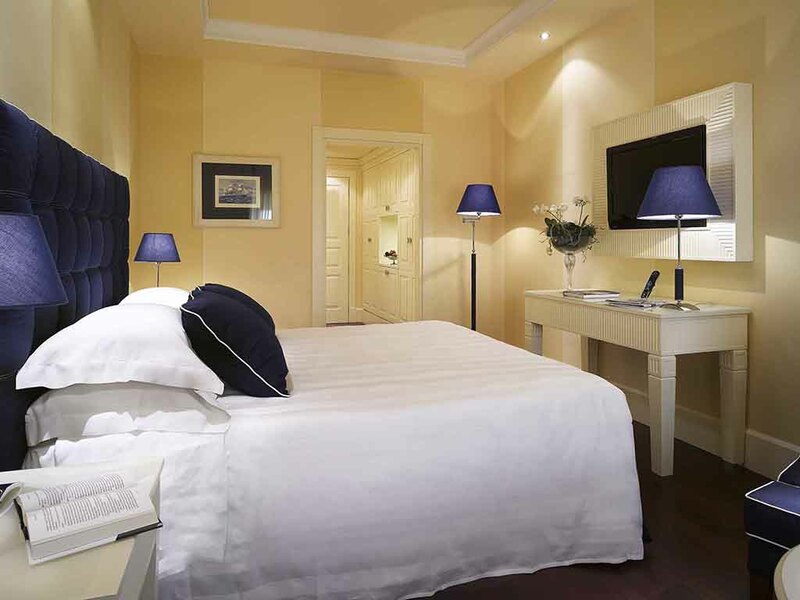 The Grand Hotel Palazzo MGallery by Sofitel enjoys a privileged location on the outskirts of Livorno, just a stone's throw from the picturesque Terrazza Mascagni, a charming and famous meeting place in the city. The majestic facade of this historic 5-star hotel invites you to discover its splendid interior. After settling into your elegant room or suite, explore the halls and corridors that have welcomed many aristocratic and celebrity guests over the years. From the hotel's rooftop terrace, you can soak up panoramic views of Livorno and the sea, while you take a dip in the pool or enjoy a drink at the bar. Treat yourself to ultimate pleasure with a spa treatment or a gourmet dinner at our restaurant. 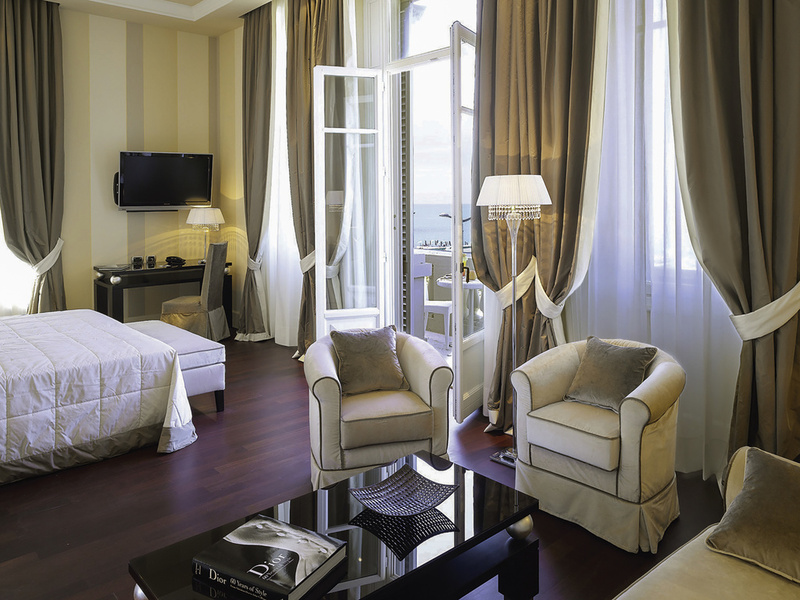 Welcome to our hotel, a splendid Belle Époque jewel overlooking Livorno's seafront. Enjoy a truly luxurious experience on the coast of Tuscany, in places that have welcomed King Umberto I, Charlie Chaplin and the Dalai Lama. Unforgettable Memories in Livorno.. The coastal town of Livorno is brimming with Tuscan traditions and Mediterranean hospitality, and offers great opportunities to explore the area and experience Italy. Stepping into a wine cellar in the small town of Bolgheri, about 37.2 miles (60 km) from the hotel, to discover the secrets of wine production is an enjoyable way to spend your day. On your return, a stroll along the promenade to admire the beautiful sunsets and picturesque views of the city is highly recommended. The hotel is located in Livorno at Viale Italia 195, just a few yards away from the Mascagni Terrace and very close to the town center, which is just a short stroll along the promenade. The train station is located 2.5 miles (4 km) from the hotel and the closest airport is in Pisa (15.5 miles [25 km]). From the A12 highway, take the exit for Livorno Centro. 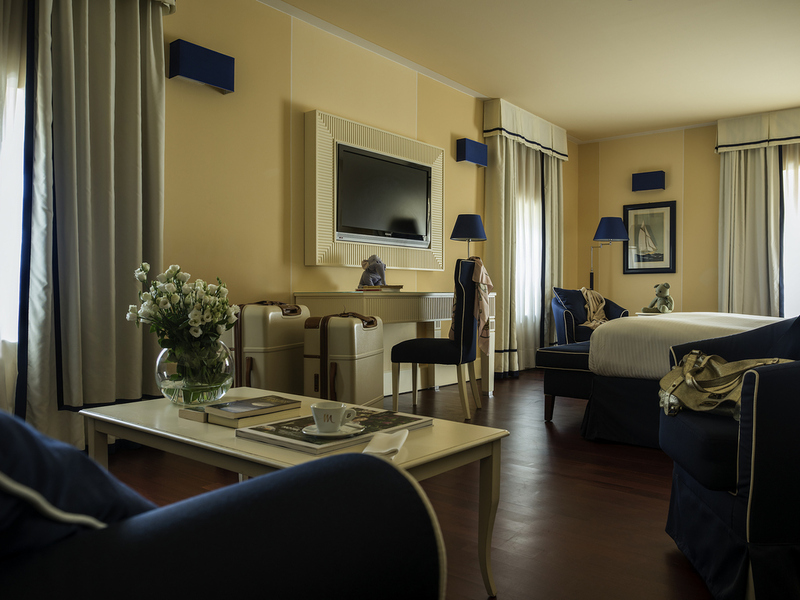 The rooms and suites at the Grand Hotel Palazzo MGallery by Sofitel take you back to a time when Livorno was an extremely popular seaside resort among European high society and traveling was a real art. 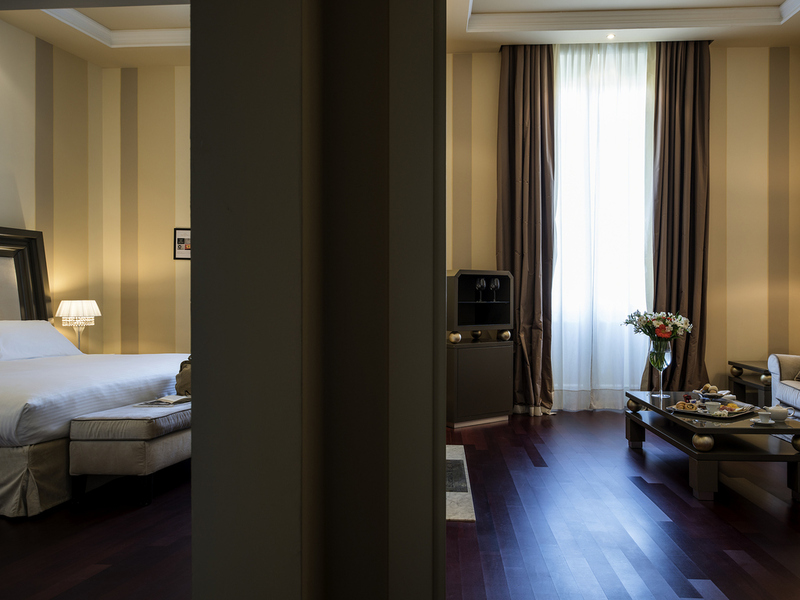 Relax in unrivaled elegance after a day exploring Livorno. High ceilings, sumptuous furnishings and enchanting views are further enhanced with superb service, to ensure that you can enjoy absolute relaxation during your stay. Elegant style and the Tuscan sunshine characterize our 5-star suites. With the sea breeze caressing your face, admire the horizon from your own private terrace and enjoy an exclusive view over Livorno's seafront. 172 sq. ft (16 sq. m), free WIFI, TV with satellite channels, air conditioning, safe and minibar. Rooms are non-smoking. A crib is available on request subject to availability. Bathroom with bathtub or shower. 172 sq. ft (16 sq. m), free WIFI, TV with satellite channels, air conditioning, safe and minibar. Rooms are non-smoking. A crib is available on request subject to availability. Bathroom with bathtub or shower. Telephone in the bathroom. Splendid sea view. 323 sq. ft (30 sq. m), free WIFI, satellite TV, air conditioning, safe and minibar. Rooms are non-smoking. A crib is available on request subject to availability. Bathroom with bathtub or shower. For up to 3 adults, ideal for families. At the Grand Hotel Palazzo, business guests receive VIP treatment. On our Executive Floor, you will find the calm you desire, far from the hustle and bustle of the seafront. The 5th floor of this historic hotel is home to nine sumptuous bedroom suites, perfect for relaxing after a day in our meeting rooms. Elegantly furnished, they offer panoramic views and two also boast a Jacuzzi whirlpool bath. Start your day with a hearty breakfast on the veranda. Later, taste refined Italian cuisine at Mascagni, our panoramic restaurant. The views of the sea and the sky will regenerate you at any time of day. Savor wines and liquors from around the world while admiring the last rays of the sun on the sea. Make unforgettable memories in Livorno with your family, friends or colleagues in our sophisticated poolside bar. A magnificent 5-star hotel in an exclusive setting on the Tuscan coast. Seminars, conferences and corporate events are destined for success at the Grand Hotel Palazzo, where work and pleasure become one. Allow our team to take care of every last detail so that you can concentrate on business. Our 6 fully-equipped meeting rooms boast natural light and 3 of them enjoy a sea view, ideal for accommodating up to 170 people. Ceilings featuring beautiful decorations and period finishes are combined with latest-generation audio and video equipment. The hotel's gardens offer a perfect alternative for those organizing outdoor events. The exceptional location of our 5-star hotel offers a unique setting for your big day. On the terrace, by the pool, in the gardens or inside: Wherever you choose to celebrate, weddings and anniversaries are fabulous at the Grand Hotel Palazzo Livorno. Thanks to its many thermal springs, Tuscany has always been a favorite destination for spa visitors. Treat yourself to an exclusive treatment or massage at our Wellness & Spa center during your holiday in Livorno. A stay at the Grand Hotel Palazzo is more than just a luxury stay. 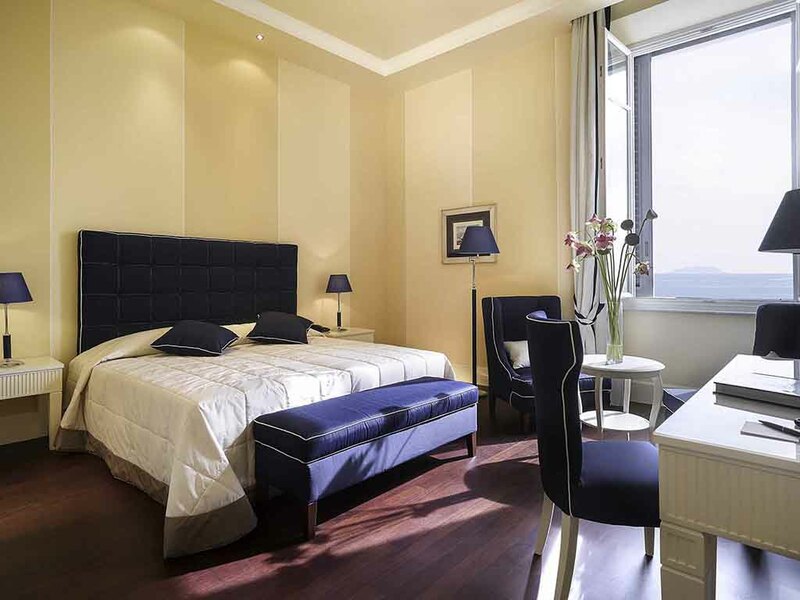 Enjoy a 5-star welcome, with tailor-made amenities to make your holiday in Livorno truly unforgettable. Welcome to our historic hotel, overlooking Livorno's seafront: It is our greatest pleasure to make your getaway in Tuscany truly unique. Do not hesitate to contact us for assistance or suggestions. Stay in shape during your holiday in Tuscany. The hotel's gym has everything you need to train. Boost your heart health with our cardio fitness machines or tone up with weights and gym balls.